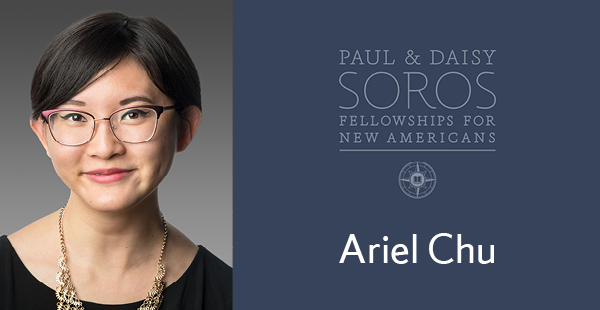 Graduate student Ariel Chu is the recipient of a 2019 Paul and Daisy Soros Fellowship for New Americans to support her studies in the graduate program in creative writing in the College of Arts and Sciences. Chu joins 29 other new Soros Fellows, selected from 1,767 applicants nationwide this year. Paul and Daisy Soros, immigrants themselves, chose to invest their money in supporting each year the graduate education of new Americans—immigrants and children of immigrants—who are poised to make significant contributions to U.S. society, culture and their academic field. Each fellow receives up to $90,000 in financial support over two years, and they join a lifelong community of New American Fellows. Below, Chu shares her story and the experiences that have influenced her writing. When I was growing up, my father had a difficult time finding employment. Prospective employers would interview him, ask him to prove his programming abilities, then deny him job opportunities—he didn’t have an American college degree, which delegitimized his years of experience. Due to her relative skill in English, my mother took over as the primary breadwinner of the household. She switched career paths and studied to become a real estate agent, all while raising two young children, helping to put my father through another degree and looking after his extended family. My father is now an acupuncturist, and my mother is a real estate broker. I’m acutely aware that they gave up their passions and primary talents in order to raise me. All the same, my decision to pursue a creative writing degree was an uphill battle—when I was younger, I got into many arguments with my parents about financial instability, negative social perceptions and the threat of artistic burnout. Growing up, I found myself walking a line between my own passions and my parents’ fears. In spite of our disagreements, my parents have supported me, placing faith in my decision to write. While we don’t always see eye-to-eye about my career, I remain grateful to my parents for their tremendous influence and sacrifice. You write about intersecting identities, the burden of everyday power differentials and what it means to be “authentic” given competing cultural influences. What have been your greatest influences on your writing? Where have you found the most inspiration for your work? My identity as a writer was shaped by my mother’s love of literature: I grew up listening to Taiwanese folk stories, poems and superstitions. On the other hand, I’ve been highly influenced by internet culture, online communities and young adult literature. I grew up inventing all sorts of digital personas for myself, writing online when I felt limited by the “real world.” I loved being at the intersection of so many different selves, even if some of them were contradictory. In my writing, I also like toying with dissonant identities. I’m fascinated by moments when social scripts fail, forcing people to develop new ways to interact. I’m also interested in the friction between our “authentic” selves and our socially constructed personas. As a queer Asian American woman, I’m often misread by others as docile, inaccessible or apathetic. In my writing, I like to defamiliarize myself: how can I puncture others’ perceptions of me and others like me? More broadly, how can I turn the “ordinary” into the grotesque, incomprehensible or mythic? I received a Robert G. Wilmers Jr. Memorial Grant from Williams College, which allowed me to spend my summer conducting research outside of the United States. I’d long known that Reykjavík has an incredible literary history and a tightly knit writing community, and I wanted to experience it for myself. That summer, I devised a plan to interview Icelandic writers about their literary influences, creative circles and relationships to the environment. Reykjavík is a UNESCO City of Literature, and its infrastructure reflects this. Many of Reykjavík’s streets are named after characters from Icelandic sagas, and it was incredible to walk around in a city steeped in literary history. I was also fascinated by Iceland’s national support for emerging and established writers. Many of the writers I interviewed received annual stipends from the Icelandic government, enabling them to act as stewards of the language. I even conducted an interview with the founding director of the Iceland Writers’ Retreat, who—during my time in Reykjavík—became the first lady of Iceland. These writers showed me incredible generosity, and I was humbled by their dedication to the Icelandic language and to each other. Many of my students have an antagonistic relationship with writing; they’re used to standardized tests, rote academic work and limiting rubrics. Understandably, they chafe at taking mandatory composition courses and writing college application essays. My goal is to teach students that—regardless of their future professions—writing can be integral to their success. Moreover, writing is a way of making our experiences legible to ourselves (and, if we’re lucky, each other). Even beyond writing, students need to know that their voices can hold power. It’s important to me that people have the language necessary to articulate their experiences and goals. I tell my students that their observations, feelings and ways of being in the world are worth interrogating. Students shouldn’t be afraid to forge their own narratives and to recognize how their stories interact with a larger social context. My novel is an exploration of intergenerational family trauma, and it’s also about cannibalism. The working plot involves a young woman eating her father in a life-or-death situation, then grappling with the fallout of her decisions. Dissociated from her actions and motives, she begins to piece together her own complicated relationship with her immigrant family, her estranged father and herself. To complicate the situation, a shadowy cannibalistic cult is lurking behind the scenes, waiting to make her one of their own. I’m lucky to live with Anthony Veasna So, who received the P.D. Soros Fellowship in 2018. Anthony was kind enough to share his experiences as a fellow, offering much-needed insight on the application process. While applying for this fellowship, I also received incredible support from other members of the Syracuse community. Jolynn Parker, director of the Center for Fellowship and Scholarship Advising, walked me through the process and gave me excellent feedback on my personal essays. Professors from other departments generously volunteered to give me mock interviews. Fellow students from the English department grilled me the whole week before my finalist panels in New York. I owe so much of my confidence to those who helped me with the application process. The best part about being a P.D. Soros Fellow is being able to share this accomplishment with my family. I remember telling my mother over the phone: “Now you don’t have to worry about me or the career I’ve chosen.” In many tangible ways, the fellowship has opened doors for me—I can envision pursuing a Ph.D in creative writing, having more time to spend on my projects and carving out more inclusive spaces in academia. I’m grateful that this fellowship gives me the opportunity to put my parents at ease. I want my family to know that, no matter what path I choose for myself, I’ll find a way to survive. The Paul & Daisy Soros Fellowships are awarded to New Americans who give promise of making distinctive contributions to U.S. society, culture and their field. Applications for the 2020 fellowships will be due on Nov. 1, 2019. The award is open to candidates 30 years old or younger who are immigrants or the children of immigrants in the United States. To be eligible, candidates should be planning to be enrolled full time in an eligible graduate degree program at a U.S. university for the full 2020-21 academic year and must not have begun the third year of the program that they are seeking funding for as of the Nov. 1, 2019, deadline. The application is available on the Soros website: www.pdsoros.org/apply/online-application. Interested Syracuse University students and alumni should contact the Center for Fellowship and Scholarship Advising (CFSA) for assistance with the application: 315.443.2759, jmpark02@syr.edu.